The FW190 was one of Germany's best fighters in WWII. Designed to replace the ME109, it was equipped with a powerful radial engine and armament to defeat the hordes of bombers that were sent into Axis territory. Cannons and machine guns provided it with a heavy punch. The model features a 30" span, and is designed for brushed Speed 400 power and 3 channel control with ailerons, elevator and throttle. It is a traditional balsa and plywood construction, with the fuselage built around a crutch to ensure a straight and true model. Wings are traditional built up construction and are fully sheeted. The tailfeathers are made from balsa sheet. The prototype was glassed and ended up at ~20 oz. It flew using a Multiplex Permax 480, APC 6x4E, 8 cell GP1100 NiMHs and a JETI 020 brushed ESC. It has since flown with a brushless upgrade to a Mega 16/15/6, APC 7x5E and 3S 2100 lipos. Another brushless option is the Hobby Lobby SK 400XT outrunner using an APC 8x6E off the same battery pack. The full construction article was first published in Backyard Flyer, May 2008. 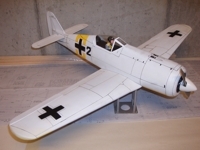 Using the optional D-9 plans this kit can be built as a "longnosed Dora" or D-9 version. The necessary modifications to the laser cut parts are shown on the plans. The D-9 prototype was powered using a Hobby-Lobby SK 400XT, a 18A BL esc, and a 3S 1300 mah lipo pack, spinning an APC 8x6E. The D-9 was glassed using WBPU and 3/4 oz fibreglass. The paints scheme was airbrushed using Tamiya acrylic paint. Ready to fly the D-9 weighed in at 17 oz. The short kit includes laser-cut balsa and plywood parts, printed plans, and a vacuum-formed plastic canopy. Choose either the A-4 (default) or D-9 plans options.